Ihave a lot more clothing and accessories for sale. DENIM CO Ladies Green Leather Type Short Jackets 12. Lovely jacket please see all photos as part of the description thank you. Condition is Used from a smoke free home please . I am having a clear out so please see my other listings thank you. Machine wash at 30°. - Low Waist. - Super Slim-Skinny. Waist - 33 cm. - Super Stretchy. Length - 105 cm. Rise - 20 cm. Thigh - 22 cm. Super slim skinny stretch low waist. Great quality and a lovely fit. Zara. 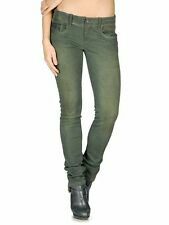 Khaki Green Leather Look Jeans. Cargo Size S Slim Fit. Condition is Used. Dispatched with Royal Mail 1st Class. Size - W25 (UK 6/8, US 2/4, IT 38/40, FR 34/36). Rag & Bone Leather Trousers. 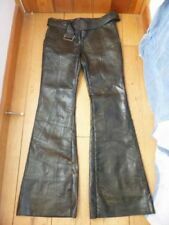 Green Leather Jeans With Ripped Knees Size 6/8. Worn once. Dispatched with Royal Mail 1st Class. 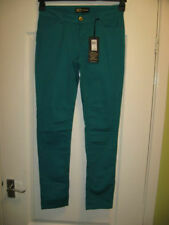 DEBENHAMS Size 14 Reg, GREEN STRETCH COTTON JEANS with A PLAITED LEATHER BELT. GREEN COTTON JEANS with BROWN LEATHER PLAITED BELT. THE JEANS HAVE A FRONT ZIP AND SIDE POCKETS. THE COLOUR OF THE JEANS IS LIGHTER THAN THE PICTURE INSIDE OF THE WAIST. so in very good condition. Made of genuine Oily Nubuk leather. 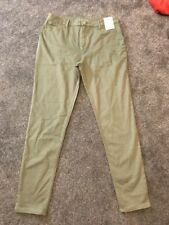 Casual trousers - outdoor trousers - hunting trousers. Slightly shorten legs at the bottom if the pants are too long. leather pantsin 5-pocket form. 2 side pockets in jeans cut, right with coin pocket. Great trousers tiny mark next to the fly see picture real leather patches. Touch ups, green fabic, leather soles, size 11M ( uk 9) shoes. Touch ups green, fabric uppers, leather soles. Button across flat shoes. New, tried on but never worn. Please see pictures,more are available on request. W27 L27Donation. 62.50% of this sale will be donated to charity as chosen by our generous donorItem SKU. Material: 100% - leatherCondition. Made of genuine Nubuk leather. in boot-cut style = slightly tapering at the bottom for better boots under the pants. Slightly shorten legs at the bottom if the pants are too long. the ideal pants for every occasion and every weather. Thigh 11" or 28 cm. Rise 9" or 23 cm. Waist 16" or 41 cm. Hip 18" or 46 cm. Cuff 9.5" or 24 cm. Inseam 31" or 79 cm.